Welcome to the GIA 2017 Conference Blog! Grantmakers in the Arts is pleased to have a fantastic blogger covering the 2017 Conference in Detroit. Lara Davis, Arts Education Manager for the Seattle Office of Arts & Culture will be posting her comments and reactions beginning Saturday, October 28. We hope you enjoy her observations and that you join this conversation. We hope you enjoy the 2017 Grantmakers in the Arts Conference in Detroit! Day 2. The scene: A passionate conversation with fellow conference attendees over breakfast. We are grateful for this time together to eat free food, consume coffee, hear from more local artist activists and cultural workers, and begin reflecting on some of the learning that defines our conference experiences over the last few days. We exchange information on sessions that have challenged us due to either an unwillingness to go deep enough, or their readiness to move us so profoundly that we’re already changed. The latter by far represents the collective experience of my table mate colleagues, and soon to be friends. During the conversation, some key questions rise to the surface. We land on – what are you willing to risk for justice through your work and the philanthropic field? We stay here for some time. You see, we recognize that things like race and social positionality (i.e., where you rank in organizational hierarchy) have bearing on whether we act or remain inert. Formal power is always present in these spaces. So, are personal agency, and the potential for collective power. In any case, this little question worm makes its way into my conscience like a red wiggler in a compost bin (which I assure you, is a good thing) and stays with me throughout the day’s journey. In this session, participants spent time learning from teaching artist leaders, administrators, and funders from various organizations, all connecting by the work of Teaching Artists Guild (TAG), of which I am a national advisor. We agreed on the premise that “A healthy teaching artist eco-system leads to quality in the field,” Jessica Mele (Hewlett Foundation), and were pushed to think about why we invest arts education. In addition to things like basic education mandates, what the arts teach, and cultural responsiveness, the opportunity gap came up – the often-invoked jargon of how oppression plays out in public education. A powerful reframing was offered by staff from Memphis Music Initiative to describe inequitable access, rather, as what we owe young people. This is about reparations, which is spot on. To address the barriers to a racially equitable arts education, we must acknowledge and deal with the challenges teaching artists face as a profession. There are huge varieties in pay including little or no compensation for non-instructional time (preparation, planning, meetings, events, administration, etc. ), and lack of benefits for many teaching artists working part-time or as contractors. A startling 75% of teaching artists are making at or below minimum wage. This is unacceptable. TAG has responded by creating a TA Pay Rate calculator in partnership with the Economic Policy Institute to support teaching artists in determining what a living wage is for the cities in which they live and work. Case studies of teaching artist training certification programs are another place in which organizations and partnerships are working to provide paid, badged, learning opportunities for teaching artists, who possess a wide diversity of formal and informal educational backgrounds. While everyone in the room was excited about these efforts, funders were challenged to think about ways to engage the tool as an educational and policy resource to advance their efforts in supporting teaching artists. Things like: more unrestricted operating funds to support teaching artist organizations, putting the pressure on larger cultural institutions to pay teaching artists at living wages, etc. The implications are clear. While there are many teaching artists doing the work, who can afford to become a teaching artist and stay a teaching artist? And, what is the field doing to support their sustainability? What are we willing to risk to make sure teaching artists can continue to do what they do in our schools and communities? If you didn’t already know, the Idea Lab is hands down my favorite thing about GIA Conferences. (If there’s any doubt, just see my previous conference blog posts.) No shade to the sessions, which undoubtedly convene a stellar array of peoples and perspectives, creating space for needed critical learning and dialog. The morning blessing that is the Idea Lab, though, situates us all in an artist-centered, artist-led ecology. So, Detroit artists are woke AF. But, you already knew. Home grown brilliance all around. And, they ain’t playing. Their call to action is like no other — as unique as the city that was home to revolutionary activist Grace Lee Boggs, and that spawned Motown and Techno music. This morning’s plenary ushered in the likes of Taylor Renee Aldridge whose work as a writer and curator exists in “direct response to the misnomers that do not consider Black people.” Accompanied by a masked drummer, Bryce Detroit brought a Detroit-style Afrocentric essence to the stage, speaking on “actualizing justice” as anathema to the idea of funders who parachute resources into a community without context, relationship or an understanding of a people’s readiness in the face persistent injustice. Jenny Lee, Allied Media Conference’s fearless leader, organizes through a confluence of arts/culture/community. I literally get chills when I watch AMC’s promo video including artists and organizers that are POC, indigenous, Muslim, intergenerational, intersectional… the list goes so beautifully on. Swoon! The arrows in the each of these artists’ quiver aims true. They are forging relationships, centering healing from structural violence, and evoking MLK’s notion of a beloved community, which as far as I can tell, is how they authentically live, engage, and create. The charge in the room was clear, “How will philanthropy change itself to change the world… to model the world we need?” A sentiment that guides Jenny Lee’s process, reframed as a call to action for the arts funding community. GIA does not play when it comes to its sessions, either. 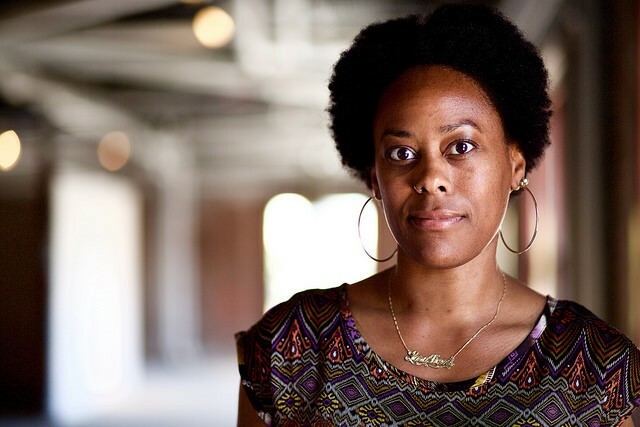 Case in point, a panel facilitated by adrienne maree brown, featuring artists who are disrupting the status quo, and creating new narratives through science fiction, engaging with campaigns, and storytelling. Artists representing a rich array of racial, ethnic, class and undocumented immigrant experiences woven into counter narratives that honor where we come from, and the full potential of where can go, collectively. brown framed the culture of this work as follows, “We are engaged in the imagination struggle,” one that requires brave and bold articulations of a present and future beyond the notion of an American Dream rooted in concepts such as nation-states and meritocracies. Panelists shared their ideals for “undocumented stories for undocumented peoples; exit poll metrics in campaigns for the cultural work that artists do, beyond what so often seen as ephemeral; dreaming and building a literary landscape that reflects all of us.” Best practice models like the Emergent Fund were referenced, examples that engage activist-led advisories to drive resources to organizing efforts in imaginative and impactful ways. The conversation was next level — like, literally, outside of any dominant narrative framework. This isn’t surprising, given that these artists are already part of communities that have been dreaming the future through our ancestors to this present moment and beyond. As jessica Care moore stated during the lunchtime performance about Detroit, its roots and possibilities, “We are our ancestors’ wildest wishes.” I couldn’t agree more. This proverb, popularized by South African disability and youth activists, served as the introductory frame for the daylong precon, Racial Equity in Arts Philanthropy. These words were presented by facilitators as a challenge to the ways in which institutions may approach racial equity. (Think, colonialism. Think, the opposite of liberatory practices.) It set the tone outright for a conversation and exploration of racial inequity in art philanthropy that is at once structural and foundational to how a nation built upon racialized capitalism, i.e., genocide and slavery, operates. So then, what is the real opportunity for racial equity within this context? The answer to that question is fundamentally rooted in both understanding the historic and persistent role arts philanthropy plays in maintaining racial inequity, and actively working to dismantle the racism rampant within and perpetrated by the field – by shifting power (money, resources, etc.) to ALAANA communities. A mouthful, I know. I’ll let these words by the wonderfully smart and funny Vu Le (Nonprofit AF) state it more succinctly. How does one break the rules? When asked this question, session participants were hard-pressed to come up with clear examples of how to share, let alone cede, power to those outside of our institutions. This is otherwise known as taking theory and putting it into ideas for practice. Sure. We understand that diversity and inclusion are not about examining power; and, inequity without the racial part is at best confusing, and at worst well, racist. But, moving from conceptual notions and understandings towards action that leads to institutional and structural change is another story. Let me pause here for a moment. I use the terminology “we” in order to implicate myself as someone working in a local arts agency, who is accountable to the public, and to the City’s racial equity priorities. Additionally, my lived experience as a queer cisgender Black woman who works to be authentically accountable to community in my work and personal life troubles this paradigm at all times. Who are you accountable to? Who is your organization accountable to? It’s helpful to first consider what implicit and explicit racism look like in arts philanthropy. In a room mixed with woke folks, and others on the journey, the list we came up with included ways in which the sector invests in organizations with racial equity statements and policies, but little practice compared to the lived experience of ALAANA organizations, and white culturally specific institutions who are considered too big to fail. Funding organizations who question the validity of people of color focused funding programs as discriminatory, the requirement of a certified audit, 501c3 status, and data from applicants surfaced as other examples of how structural racism plays out in this work. A poignant illustration was made about culture in that often times relational decisions can define the nature of relationships between dominant culture organizations and funders, while ALAANA organizations are expected to just follow the rules. Studies were also referenced that show how boards of trustees of major foundations are primarily white men with Ivy League degrees. And, when considering arts funding within the context of race, we need only look to Not Just Money: Equity in Arts Philanthropy (Helicon Collaborative report 2017) to see that despite the conversation about the need for racial equity, things are worsening. Root causes to racial injustice within the field are not fully being addressed. Culture creates policy. Policy shapes racial outcomes. The work for change lies in how we can and are responding to racism and white supremacy culture. Where do we choose to push and not push? Why? A litany of ideas arose that reflect efforts of staff-led organizing including, workers engaging in racial affinity groups to build allyship and solidarity to push against normative power structures alive and well in the sector. We must also lead with accountability to community. A case study presented by Philly’s Leeway Foundation that funds women, trans and gender non-conforming artists, urged participants to develop relationships with those most impacted by structural racism. Their leadership must be reflecting in the doing of how we do. Always. Our marching orders are clear. Do the work. And, keep doing it. Lara Davis has been active in youth development and community arts education for more than a decade. She has served as a Seattle arts commissioner and as program director for Arts Corps, a youth arts organization. At the Seattle Office of Arts and Culture, Lara manages Creative Advantage, a public/private partnership to ensure equitable access to high quality arts learning for all Seattle students. Lara serves on the National Advisory Committee for the Teaching Artists Guild and facilitates equity and racial justice trainings. As a person of color, Lara understands the value of cross-cultural, multi-sector efforts to dismantle racism and other oppressions, and to promote justice. As an artist and arts administrator, she knows firsthand the power of creativity necessary to build access, foster engagement, transform communities, and inspire systemic change.